Found one file extension association related to Phantasmagoria and 1 file format developed specifically for use with Phantasmagoria. Phantasmagoria is a rather large adventure game from Sierra in terms of CDs (7), not necessarily in length. You play Adrienne, who has just moved into an old mansion with her photographer husband Donald. Shortly after moving in, Adrienne begins to experience horrifying nightmares and have odd encounters inside the creepy old abode. Further, the house is having a severe effect on her husband, changing him for the worse and you must discover its secret before he (or the house) kills Adrienne. The game places heavy emphasis on full motion video for exposition and cutscenes at various junctures to advance the storyline. Further, Adrienne is represented as a digitized character roaming around pre-rendered settings in the house. 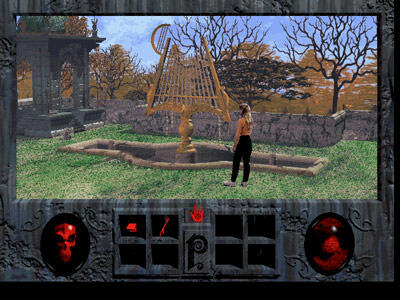 She inspects various rooms, finds items, adds them to her inventory, finds places to use the items, and triggers advancements in the storyline. There are 7 chapters to the game, and there is a status screen in the game which tracks your linear progress within the chapter. If you need more information please contact the developers of Phantasmagoria (Activision Blizzard, Inc.), or check out their product website.